Make sure and try these tasty treats while visiting Russia! Although Russians are known for their love of home cooking, it’s not always convenient to go home and make a big meal. These popular local snacks can be comfort food, too! This pastry with the funny name is a much-beloved snack across the country. Chebureki are thin triangles of dough stuffed with minced meat and spices and quickly fried in boiling oil. Be careful when biting a cheburek: meat juices are likely to squirt from the hot pie! Chebureki can be bought at special cafes called cheburechnayas that are often associated with the Soviet era. These thin, crepe-like pancakes have been consumed in Russia for centuries. Today they are the most popular type of Russian street food, and the most popular place to buy them is the “Teremok” chain. The staff at these cafes dress in old-style Russian costumes and address their customers as “sudar” and “sudarynya” - the old Russian form of “sir” and “madam.” Solid round blini are cooked on a griddle while you wait and can be had with fillings ranging from ham, cheese or red caviar to honey, jam or sweetened condensed milk. Teremok is even expanding its empire abroad - you can find an outlet in Midtown Manhattan! This root vegetable is as beloved in Russia as in many other parts of the world, and the fast-food chain “Kroshka-Kartoshka” has capitalized on its popularity. In contrast to its name, which means “tiny potato,” the cafe offers giant baked potatoes with a variety of fillings, including cheese, butter, pickled mushrooms, salty cheese with dill and salmon. This sliced meat wrap invaded the country in the 1990s, and stands selling them could quickly be found at every metro station. At a typical shawarma stand, a huge cut of meat is roasting in an open window. 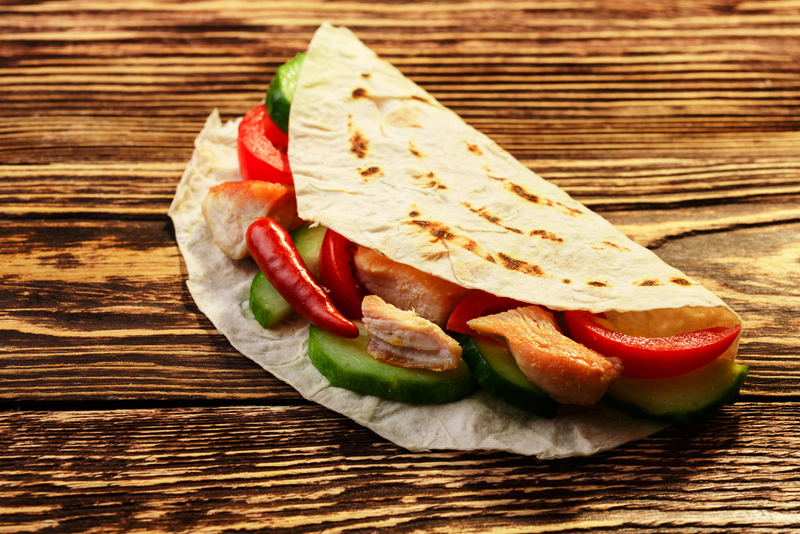 Sandwiches are sliced to order, then mixed with vegetables, ketchup and mayonnaise and bound tightly into lavash. Today shawarma is most beloved by comedians and journalists: the first joke about this ubiquitous street food while the second make it a point to know the best shawarma stands in the city. Corn was introduced into Russia by Soviet premier Nikita Khrushchev, who called it the “queen of the fields,” in the hope that it could feed the entire country. Khrushchev’s experiment wasn’t successful, but corn remains a popular street food - many Russians have fond memories of sinking their teeth into an ear dredged from a huge pot of boiling water, covered in butter and salt. Today stands offering boiled corn on a stick can be found in many Moscow parks. The word “pirog” (Russian for “pie”) derived from the ancient Russian “pir” (“feast”), clearly demonstrating that no celebration could be had without them. Today small pies are available in every cafeteria. Stuffed with fish, meat, rice, mushrooms, spring onion and eggs, vegetables, berries and fruits — you can never have enough of them.